Grace and Ken Evenstad, founding owners of Domaine Serene Winery and owners of Chateau de la Cree in Burgundy, France, are the recipients of the 2018 Distinguished Service Award by Wine Spectator Magazine. The award, which honors those who have made significant and long-lasting contributions to the wine industry, was awarded to the Evenstads for playing a key role in the Willamette Valley's rise from a sleepy wine community to one of America's most dynamic and respected growing regions. "We are honored and thank Wine Spectator for this prestigious award recognizing our continuous efforts to elevate Oregon wines on the global stage," Grace Evenstad said. The couple accepted the award as the guests of honor at the Grand Award Banquet on the final night of Wine Spectator's 38th annual New York Wine Experience on Oct. 20. The honor crowns a 30-year career spent pushing the boundaries and the norms of business and winemaking in the region. True pioneers, the Evenstads have pushed the envelope, planting Pinot Noir vineyards at high elevations — including west-facing slopes — and establishing their highly successful and world-renowned Chardonnay program by planting early ripening Dijon clones in deep Jory soils atop the Dundee Hills. Their Cote Sud vineyard was one of the first Dijon-clone Chardonnay plantings in the U.S. in 1992. In 2001, the Evenstads completed construction of their current state-of-the-art, five-level, gravity-flow winery. In 2004, Domaine Serene was the first winery in the country to make barrel-fermented white wine from Pinot Noir grapes, their Coeur Blanc "White Heart" Pinot Noir. In 2017, Domaine Serene opened a new best-in-class hospitality center, the Clubhouse at Domaine Serene, that is changing the landscape of fine wine hospitality in the Pacific Northwest. In 2018, they completed a new white winery dedicated to the production of Chardonnay and sparkling wines, the first of its kind in Oregon. In September, the Evenstads pledged $500,000 in hopes of raising a total of $1 million through matching industry donations to launch an initiative taking aim at eradicating the Grapevine Red Blotch virus, a clear and significant threat to vineyard properties and winemaking in the Willamette Valley and beyond. 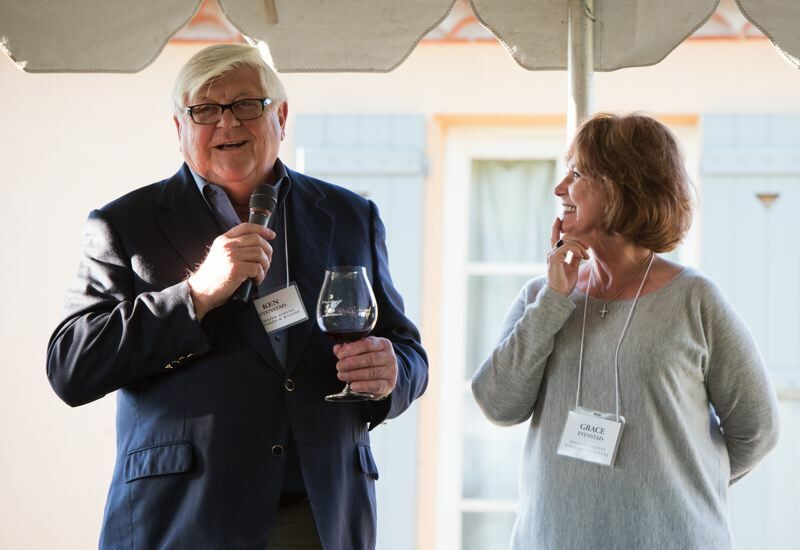 This sizeable donation and initiative comes on the heels of the largest gift in support of wine studies in Oregon history: $6 million to endow the Evenstad Center for Wine Education and the Evenstad Chair in Wine Studies at Linfield College. The program will be the first in the country to offer an interdisciplinary liberal arts degree and master's degree in wine studies. The Evenstads have now donated or raised more than $25 million for philanthropic causes over their careers. With this award, Grace and Ken Evenstad join the distinguished ranks of the wine and culinary industry's most recognized leaders: personalities like Ernest and Julio Gallo, Robert Mondavi, Eric de Rothschild, Julia Child and longtime friends Piero Antinori and Emeril Lagasse. To learn more, visit www.domaineserene.com.